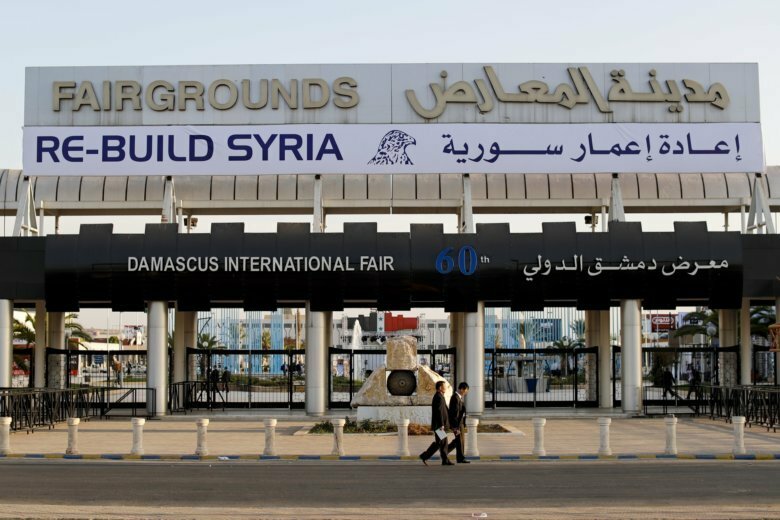 DAMASCUS, Syria (AP) — With back-to-back trade fairs held in Damascus this month, Syria is hoping to jumpstart reconstruction of its devastated cities by inviting international investors to take part in lucrative opportunities. But the absence of significant Western participants, the challenges posed by international sanctions and the lack of a political solution to the seven-year-old conflict point to massive hurdles ahead. But the relatively small-scale participation of companies from Syria’s allies, Russia and Iran — both under U.S. sanctions — can hardly even begin to cover the enormous reconstruction costs in Syria, estimated to be anywhere between $250 billion and $400 billion. A U.N. agency estimates the war has cost $388 billion, and Syria says it needs $48 billion in short term investments for the housing sector alone. Around half of Syria’s pre-war population of 23 million has been uprooted – nearly 6 million fled abroad, while 6.6 million are displaced within Syria — and entire cities lay in ruins, their infrastructure decimated. Syrian officials say that with the government’s military gains over the past year, it’s now time to focus on rebuilding. The government now holds just over 60 percent of Syria’s territory, with the north largely controlled by U.S.-backed and Kurdish-led forces, opposition fighters allied with Turkey, and insurgent groups. “The process of eradicating terrorism has reached its final stages, and the reconstruction phase is knocking on the doors,” Public Works and Housing Minister Hussein Arnous said Tuesday, after a ribbon-cutting ceremony inaugurating the 4th International Trade Exhibition for Rebuilding Syria. Arnous said 270 companies from 29 countries are taking part in this year’s exhibition despite the sanctions imposed on Syrian. Most of the companies participating in the four-day exhibition are Syrian, followed by Lebanese and Iranian exhibitors. “I don’t hope that the West will come here, because it had a big hand in the war against Syria,” said Youssef Alousi , sales manager at Balkis Ceramics, a Syrian tile manufacturer which was showcasing, among other designs, a picture of Syrian President Bashar Assad printed on tiles. “Syria will be rebuilding Syria,” he added. The exhibition is being held at the Damascus International Fairgrounds near the airport, not far from wrecked former rebel strongholds. Israel struck targets near the airport last month. Buildings with gaping holes and others with their top floors collapsed could be seen on each side of the highway leading to the fair — testimony to the ferocious fighting that raged there for years. At the opening of the convention on Tuesday, Syrian officials, journalists and visitors walked among stalls for construction materials, industrial supplies, and even an Iranian maritime company with intricate model ships. Syria’s tiny neighbor, Lebanon, had the second highest number of participants, with 35 companies exhibiting their products Tuesday. Lebanese companies are anxious to get a piece of the reconstruction cake, but the Lebanese government is split, with Prime Minister Saad Hariri reluctant to normalize relations with Syria under Assad. Although 38 Russian companies took part in the Damascus International Fair last month, only one made it to Tuesday’s opening. Russia is a key ally of President Assad, and its military support, starting in 2015, has helped turn the tide in his favor. Russian President Vladimir Putin has been lobbying for Western aid funding, while helping the Syrian government prepare for an offensive to retake the last rebel stronghold of Idlib, in northwestern Syria. Valeriy Anisimov, who works for the Russian petrochemical firm JSC Promcatalys, says it hopes to tap into the underserved market but has yet to find a way around the sanctions. He said he was hoping to speak with other business people at the conference about transferring money into and out of Syria. “There are many problems with Syria industry because of U.S. sanctions, and our company is ready to provide all the catalysts, all the technologies that Syrian customers cannot get because of these sanctions,” he said, adding that his company is in talks with two oil refineries in Syria. Russian companies face competition from China, which is making serious, if cautious, efforts to snap up reconstruction offers. Tarif Nahhas, the Syrian representative of the Chinese Truemax engineering solutions company, said China is still trying to find its way in Syria, with many companies worried about security and stability. He said exhibitions like these help company representatives assess the situation on the ground for themselves. For now, Syria will have to rely on small-scale investments and development projects to jumpstart reconstruction efforts, but critics say the government lacks a clear strategy for rebuilding. “The U.S. taxpayer is certainly not going to subsidize Assad’s campaign of destruction,” she said. The State Department on Tuesday linked reconstruction assistance with the need to achieve “irreversible” progress in a U.N.-sponsored political process. Iran’s ambassador to Syria, Javad Turk-Abadi, said it’s only natural that Iranian investors should come to Syria to help it rebuild, shrugging off U.S. sanctions against both countries. “America’s sanctions, same as with its politics, are unilateral, and the result is that America will stand alone, punishing only itself,” he said.